Pocket chainsaw invented! World rejoices! Prince bloody Philip buys one! Bosch last night unveiled a highly impressive range of smart home devices. But never mind that, because it also showed off this, the EasyCut NanoBlade pocket chainsaw. Admittedly, Bosch isn't referring to it as a chainsaw of any kind ("cordless special saw" seems to be the favoured nomenclature), and we wouldn't necessarily recommend putting it in your pocket anyway. But clearly, a scaled-down, handheld chainsaw is what it is. Woah boy. Launching at the Royal Horticultural Show in Chelsea, the EasyCut promptly sold out and, apparently, Prince Philip bought one. Well, he is now technically retired and doubtless looking forward to many happy years of using a pocket chainsaw to prune branches from the trees in Buckingham Palace's grounds, we dare say. Giving a straighter cut than a jigsaw, the EasyCut also has indoor uses, such as letter opening, cutting through bits of dowel, plunge cuts, gangland revenges and zombie slaying. If we're being totally honest, we can't think of a single legitimate use for this that couldn't be better handled by a different tool, but it is versatile enough and cool enough that we'll probably just buy one anyway. Stat shot! The EasyCut boasts a cutting depth of 65mm in wood and 30mm in plastic, with a no-load speed of 4,000rpm. We can confirm it goes through dowelling like a hot knife through butter. And what butter it is! 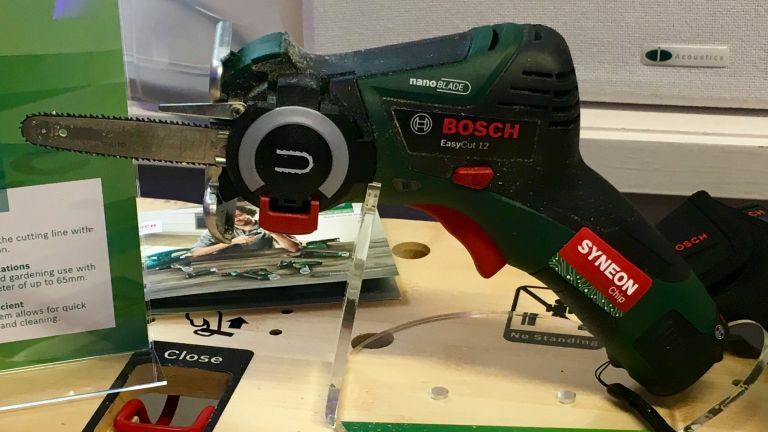 The SDS blade swapping system is incredibly simple, and the EasyCut comes with the same 12v battery and charger as all other small Bosch power tools. The cost of this miracle of modern technology? Just £130.